I’m going to preface this review with a pro tip for twitter users. If you follow enough writers, you will never want for free e-books. Case in point, some weeks ago Mr. Umstead was giving away digital copies of the first book in his Evan Gabriel Trilogy. I learned of this via another author who was so kind as to help spread the word. Thanks, Leah. 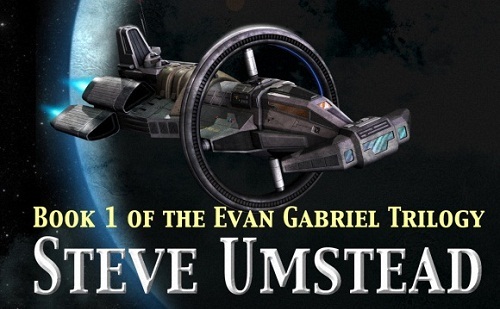 Prior to her tweet, I had never before heard of Steve Umstead or his eponymous character Evan Gabriel. Though I’m not quite sure how that came to be the case given the quality of his novel. After logging on to Amazon, two things immediately got me excited about this book. The first was the novel’s cover art, which featured a hammer headed starship orbiting a planet. I don’t care if rovers and Cylons are the future of manned space exploration; starships are cool. The second feature, which really “sold” the novel, was the accompanying headline review touting Umstead’s literary style as something which brings together the best of John Scalzi and Tom Clancy. Like Scalzi, Umstead works within a golden age of sci-fi framework; wherein the post-colonial man goes about a new era of colonization via advanced technologies and starships. At the same time, Gabriel’s Redemption balances these very traditional science fiction elements with Earth based international intrigue, spy games, high stakes politics, and a dedication to military ephemera – up to and including submarines. Thankfully, Umstead is not as exhaustive as Clancy in his techno-babble. And unlike another aficionado of starships and space navies, David Weber, whose exposition often comes at the price of a steady narrative, Umstead’s detail oriented turns happen at the exact right moments. So while the Scalzi/Clancy comparison is valid, there is however another who I would invoke with respect to Mr. Umstead’s style: Chris Roberts. Though I may lose the literary crowd with this reference, I suspect I will wake up the gamers reading this review when I say Gabriel’s Redemption is the second best thing to a novelization of StarLancer. In so much as this novel is about power armour clad special forces soldiers undertaking a clandestine mission on a far flung charter colony, it’s also a political struggle between near-future supra-nations. The North American Federation, the Chinese Empire, and the South American Federation are all engaged in a sci-fi equivalent of the “Scramble for Africa.” Rather than taking the Scalzi approach to space empire building, wherein space is big and nasty aliens want nice planets as much as we do, Umstead contains his narrative through the use of wormhole technology. This has the added benefit of keeping the hard sci-fi pedants at bay by removing any discussions of “FTL drives”. Similarly, starships within the navies of the space faring powers are subject to rules of acceleration and artificial gravity via rotating ship components. As is the case with any novel that involves starships and exo-planets, a suitably motivated person could probably find a few places in the text to poke holes. However, the narrative within Gabriel’s Return is tight enough and the explanations suitably satisfying as to disarm any such tedious inclinations, save for the most trollish of readers. One particular thing I appreciated within this book is the author’s ability to balance optimism for the future with a sense of realism regarding the world that exists outside of our contemporary windows. Set toward the end of the 22nd century, the novel sees Mars colonized before the advent of interstellar travel. Yet the Martian colonial venture is a disaster due to the complex logistics involved in creating self-sustaining ecosystem. Similarly, the current problems of our world are not hand waved away through the gimmicks of future tech. Yes there are fusion reactors and biological computer implants, but the novel’s first chapter is clear in illustrating the consequences of man-made climate change, even if it is one hundred and fifty years into the future. For all the wonders space travel brings to the streamlined nations of the Earth, this is a future of resource shortages, unseasonable warmth, and rising sea levels. In that sense, Umstead’s future colonial experience is quite apropos of any number of historical examples wherein the influx of new resources and real estate are not the cure-all colonial architects would imagine. The colonies become transit points for luxuries and, in some cases, excuses for hegemonic powers to fight one and other. 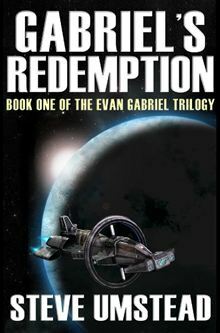 Notwithstanding Evan Gabriel’s Kirk like ability to get a mostly irrelevant character in bed toward the end of the book, probably as a means of setting her up as a more developed character in the second novel, Gabriel’s Redemption is quite the solid read. It may not set any new frontiers in storytelling, but it is refreshing in its vision of a future that doesn’t devolve entirely into human extinction and ecological catastrophe. Gabriel’s Redemption is written and published by Steve Umstead. E-book versions are available via Amazon, Indigo, and all the rest. Woot! I done a good! Leah Petersen recently posted..It a Launch! Peter Solomon’s debut: HENRY FRANKS!